Yowsa! Looking for something to impress? This classic French dish is basically chicken in a wine sauce. I substituted more chicken broth for the wine and did not dredge the chicken in flour; otherwise, the recipe remains intact. If you’re looking for something nice to serve the family or company, give this a try – it really wasn’t difficult at all, just takes some cooking time. Preheat oven to 325-degrees F. In a Dutch oven or heavy bottomed oven-proof pan/baking dish, heat oil over medium-high heat. Salt and pepper chicken on both sides. When oil is heated, add chicken to pan; brown each piece for ~1-2 min each side. Remove chicken and set aside. Add additional oil to pan, scraping up any bits from bottom of pan. Add mushroom and cook, stirring occasionally, for 5 min. Add onions, carrots, garlic, thyme salt, and pepper. Cook, stirring occasionally, for 5 min. Stir in chicken broth, parsley, and bay leaf. Add chicken, tucking into sauce. Cover and transfer to oven. Cook at 325-degrees F for 2½ hours. If sauce is not thick enough, remove chicken and cook sauce on stovetop over medium-high heat until slightly reduced and desired thickness. I did a much smaller batch of this, just for myself, in a deep oven-safe skillet. I’m curious if you could just leave the covered skillet simmering on the stovetop for a couple hours – I’m sure it’d be “fine” but perhaps the chicken would dry out or not get the same depth of flavor. I also wonder how it would turn out if you just threw everything into the crockpot for a few hours after searing the chicken and sautéing the veggies (which adds flavor behind just putting raw ingredients in the crockpot). Back to this depth of flavor – this was delicious! 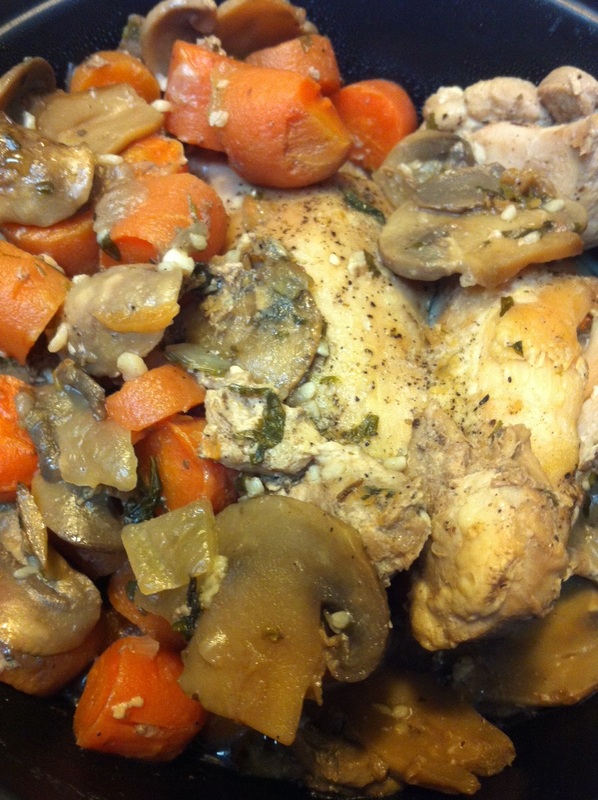 The carrots had softened up, which I like, and absorbed the chicken and broth flavor. It really reminded me of the pork or beef roasts my mom or grandma would make with potatoes and carrots. Magically the carrots were always somehow my favorite part. Don’t be afraid to get out of your cooking comfort zone – try new things and be willing to expend a little more energy or time when you can. You might just find something amazing! Feast classic, feast French, and as always…FEAST ON!! !